The D.A.G.E.R. System is a review utility setup designed to help disabled gamers learn about the latest and greatest games and how well they meet the criteria for those with visual, audio or motor impairment disabilities. Well, two big new games have been added to the database and they didn't score so well. DAGERS recently reviewed Rockstar Games' Grand Theft Auto V, making note that the story and atmosphere are grand, parroting many of the exact same praises and lauds from other top tier, middle-class and low-end sites. The praise only goes so far, however, as author Robert Kingett makes it known that there are inhibitory mechanics to the way GTA V is played by those with physical disabilities. While GTA V gets high marks for its aiming and movement mechanics, as well as a pass on the driving system (mostly thanks to being able to use taxis) the game scores low when it comes to visual processing and tooltip help for the visually impaired. Kingett notes that the text in the top corner of the screen is too small at times and that it made it difficult – nay, it made it impossible for him to complete a mission. He also notes that reading the in-game e-mails was difficult as well, but he did issue praise for Rockstar having a “vibrate” function for the in-game phone for those with hearing impairments. Batman: Arkham Origins doesn't score much higher than GTA V, as DAGERS' Josh Straub makes it known in the review that the fine-motor skills required for the game will make it extremely difficult for gamers with wrist or hand disabilities. While there is a measure of appreciation shown toward the game's Detective Mode, a feature that enables players to see the game in an almost sonar-wireframe mode, the problem is that the rest of the game is dark and gritty and it could be difficult for those with visual impairments to see the game properly. The visuals are only a small part of the problem, while the story and open-world mechanics were a delight, Straub notes that the controls are the biggest inhibitory factor of the game. Why? Because there are quick-time events right at the start of the game where you're required to use both hands to get through a rather difficult segment. It's noted that help was required from an able-bodied individual to get past some of these segments, but they were far and frequent enough to bring a halt to Josh's venture throughout Gotham City. While both games are heralded as top-of-the-line AAA titles, they also seem to fail pretty hard at being made for the convenience of physically disabled gamers. Both GTA V and Batman: Arkham Origins are available for purchase right now. 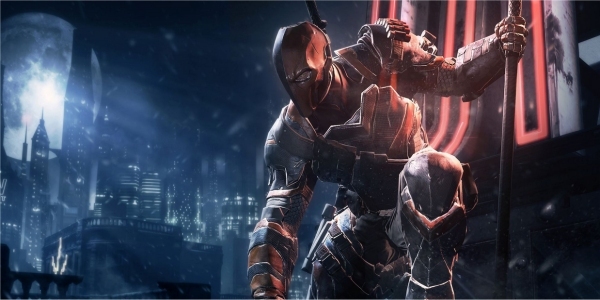 You can also check out a quick collage of key review quotes for Arkham Origins right here, where many reviewers point out more flaws than those that simply affect the physically disabled.